Flying to Manchester? Search from the top airlines to book your perfect Manchester flights and explore Manchester with Rehlat's cash back & discount offers! 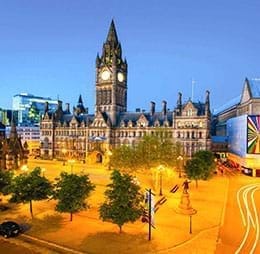 Manchester is one of the largest cities of England and contains a rich cultural and traditional values, worth to see and feel. Rehlat has great offers and last minute deals for all flights to UK including flights to Manchester. Manchester invites millions of travelers from around the Europe, as well as Asia and the Middle East. The city has lots of interesting places to visit including Manchester Art Gallery, People's History Museum, Manchester Museum, National Football Museum and Heaton Park. UK's second largest city Manchester never fails to surprise visitors for its endless adventurous activities and outdoor sports. Manchester is known as one stop shopping destination that offers countless shopping malls, international flagships, high-end luxury boutiques, vintage stores and exquisite jewelers. Manchester has a variety of shopping districts covered all around the city. It is a perfect destination for shopping and fashion lovers. Manchester is one of the finest places in the UK that offers a wide selection of food options that includes Japanese, Indian, Thai, Chinese, Mediterranean and much more. From rooftop restaurants to riverside terraces, Manchester is home for its world class eateries across the city including Castlefield, Gartside St, Ridgefield M2, Deansgate, and much more. Manchester has one of the strongest nightlife scenes in the UK with countless pubs, live music venues, bars, comedy clubs, dance parties, and much more. Here are some of the excellent places for nightlife in Manchester: New Wakefield St, Deansgate, Whitworth St West, and much more. The local transportation in Manchester consists of various modes including local buses, taxis, cabs, trams and rail services. Taxi and cab services are available at any corner of the street and provide high-quality and professional service for its customers. Manchester Airport is a primary international airport that serves Greater Manchester. It is the third busiest airport in the UK that handles more than 25 million passengers annually. Manchester Airport is the main hub for Europe's largest regional airline Flybe. Terminal 1: It was opened in 1962. This terminal is used for scheduled and charter operations for EasyJet, Jet2 and Thomas Cook. Terminal 2: T2 serves both scheduled and charter flights to many European destinations. It handles more than 8 million passengers every year. Terminal 3: This terminal is used by major airlines including American Airlines, Ryanair, KLM, British Airways, Air France and Flybe. Manchester Airport serves high-quality and professional transfer services for passengers to reach the city center. Cab and taxi serves are available 24/7 at an affordable cost. Manchester Airport operates local buses, trains and trams services that connecting to all major cities in the country.